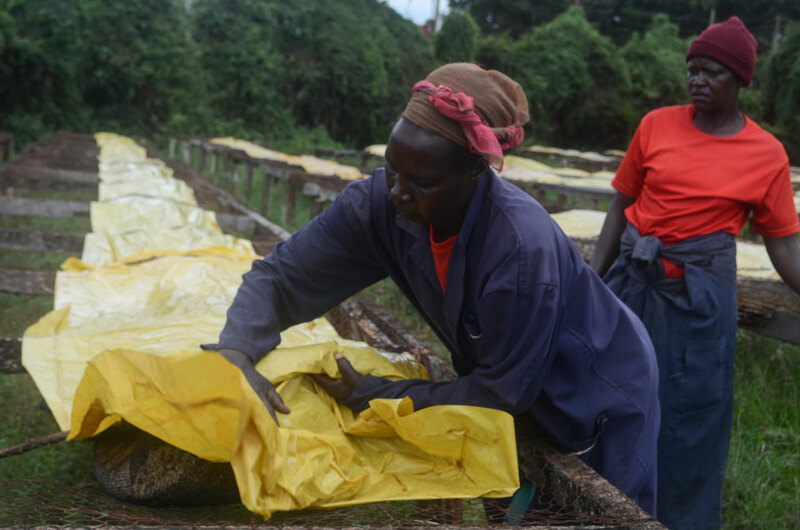 Miriam Njambi (right) helps other women to cover coffee on drying beds as Monica Wangari (left) takes a rest, at Karindundu Coffee Factory in Nyeri County, Kenya. All photos by Daniel Sitole. Miriam Njambi, 70, knows how women take care of coffee farms in the Mount Kenya region and elsewhere in the country. Njambi wakes up around 5 a.m. to prepare porridge for the family and milk her two cows. She proceeds to the farm at 7 a.m., carrying her packed lunch of Githeri (boiled beans mixed with maize grains and potatoes). She harvests her coffee until 2 p.m., when she delivers the berries, carrying about 30kgs of them on her back, to Karindundu Coffee Factory, Nyeri County. The factory is four kilometers from her home, where the farm is located. This marks the end of her day in the farm, but now she has to go home, milk her cows a second time, and prepare dinner for the family. She plans to repeat it all the next day. Njambi’s experience is just one of what Kenyan women in coffee- and tea-growing regions in the country go through. Kenya is one of the top producers of coffee and tea for local consumption and exports. The two commodities are the principal cash crops from which the country earns foreign exchange. But coffee and tea drinks enjoyed by many people around the world are the result of the hard, uncompensated labor of Kenyan women who dedicate their time and effort to producing the crops—at little to no returns, thanks to the discretion of men. Geoffrey Wahome and his wife Alice Wahome on their farm in Mathira village. Kenyan women spend much of their time working on family land growing cash crops as men take charge of bank accounts and spend the proceeds of sales as it pleases them. 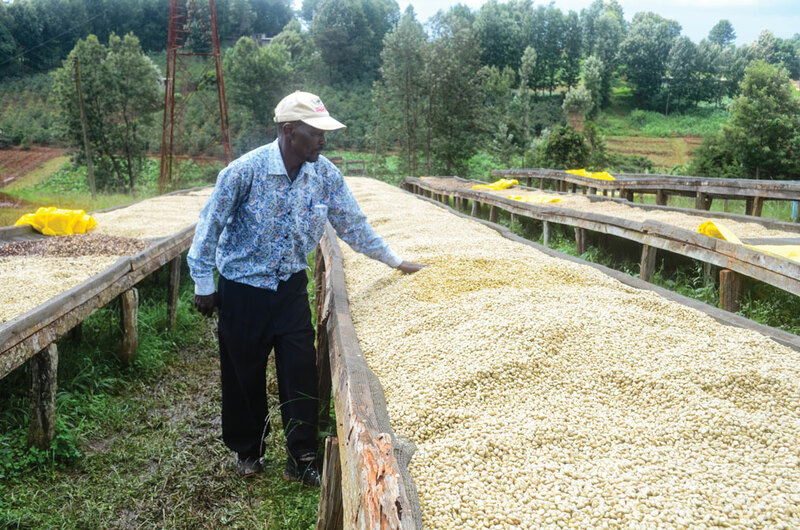 The Mount Kenya region (Nyeri, Kiambu, Muranga, and Kirinyaga counties in particular) leads in the production of some of the country’s highest-quality coffee, because its good weather and high altitude is conducive for growing many cash crops. 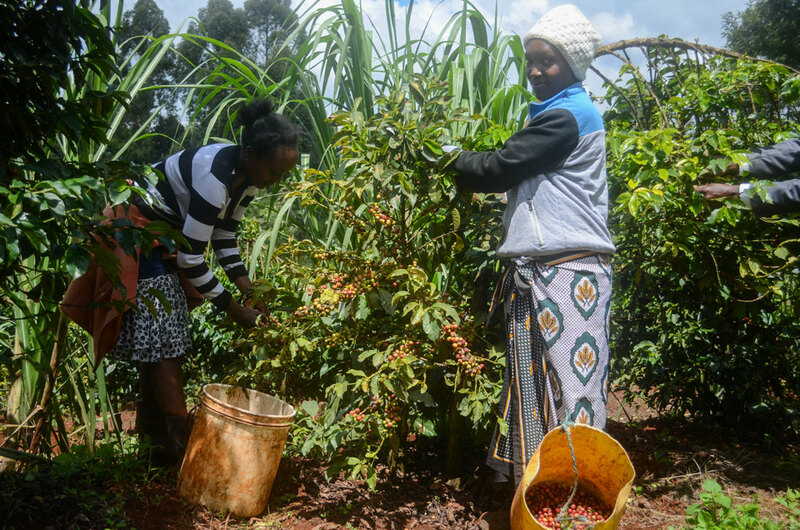 According to the Kenya National Bureau of Statistics (KNBS), small farmers, owning 0.3-0.5 hectares, produce 75 percent of the coffee in the country, with women providing 80 percent of labor in the farms. However, the majority of women working on family coffee farms do not have access to the income from their labor or know how it is spent, because overwhelmingly, men are in control of finances and financial decisions. 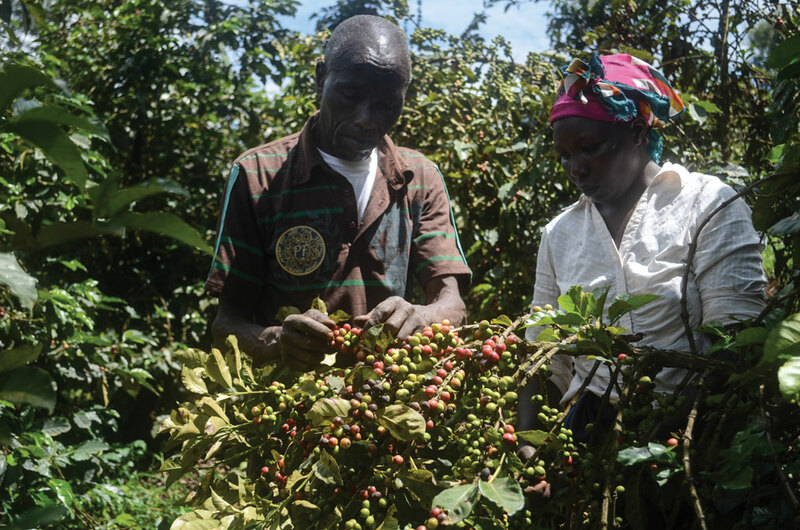 Ruth Wangui (right) shows the coffee berries she harvested in two hours as Joy Ngari (left) goes on harvesting. The two women are working on the family coffee farm in Mathira village, Nyeri County. Many men do not tell their wives the income received from coffee sales. Rather, they decide how much to give to their wives for household expenses, while spending the rest on frivolities. Sometimes a year’s income is spent in a few weeks, leaving families in financial stress to pay school fees, farm inputs, medication, and food. The plight of women is widespread throughout all cash crop production in the country. Women growing tea, avocados, and macadamia nuts are facing similar issues as those growing coffee. Besides taking care of the homes, a responsibility common to many Kenyan wives, they commit the rest of their lifetime to working on the farms—at much cost. Cecilia Mwangi working on coffee drying beds as supervisor Joseph Muchiri inspects her work, at Karindundu Coffee Factory. Women farmers clear bushes, prune, dig trenches to prevent soil erosion, plant, and graft where necessary. They take care of the plants starting from nurseries, planting, applying chemicals, harvesting, and carrying the coffee berries on their backs to the factories. Though men participate in most of these activities, some of them vanish after the payments for the coffee are handed out. They abandon their families, sometimes without food, and spend the earnings on traditional brews and locally made alcohol. Sometimes, out of anger and frustrations, the women band together to flush out men from night clubs and traditional brew hideout dens, demanding for the coffee money or to prevent them from spending the family cash. Women interviewed want their husbands to include them as bank account signatories, with rights to withdraw cash as the needs arise. But men resist and consider them outsiders on matters of land and coffee income. He added that lack of involving women on how to use the farm income contributes to many children dropping out of schools due to lack of fees, domestic violence, separations and divorces, and sometimes deaths. Some men do, however, involve their wives in decision making and run joint accounts. According to Karindundu Coffee Factory manager, James Githinji, less than three percent of their over 1,700 members operate joint accounts with their wives. James Githinji, Karindundu Coffee Factory manager, inspects moisture of coffee on drying beds. Joseph Mwangi, 58, is one of the few men to allow his wife to access the coffee money—but with limitations. He said his friends do not know, because he worries they will laugh at him if they do. Mwangi cannot even let his brothers know, because it will trigger family discontent. Though Mwangi appears more accountable to his wife than other Kenyan husbands, her freedom of access to the coffee income is still only nine percent, against the 80 percent of her labor input, as per national data. Land ownership has also been a challenge to women in Kenya. According to the Federation of Women Lawyers (FIDA), 32 percent of households in Kenya are headed by women, but only one percent of them own land in their names, while five percent of women share the ownership of land with their husbands. Men in coffee-growing areas have taken the advantage of customary traditional laws to marginalize women. Kamau says agricultural land in Kenya will always remain in the name of men, because family land is acquired through inheritance. Under the customary laws in Kenya, the rights of family land ownership belong to fathers who pass the same to their sons through inheritance. Cases of in-laws evicting women from their matrimonial homes after the death of their husbands are very common. In 2013, the National Assembly passed the Matrimonial Property Law, which allows women to jointly own property or land with their husbands, but only if they bought it together; the law does not cover family land that the husband inherited from his father. Based on customs and practices of various Kenyan communities, women are not allowed to inherit family land. 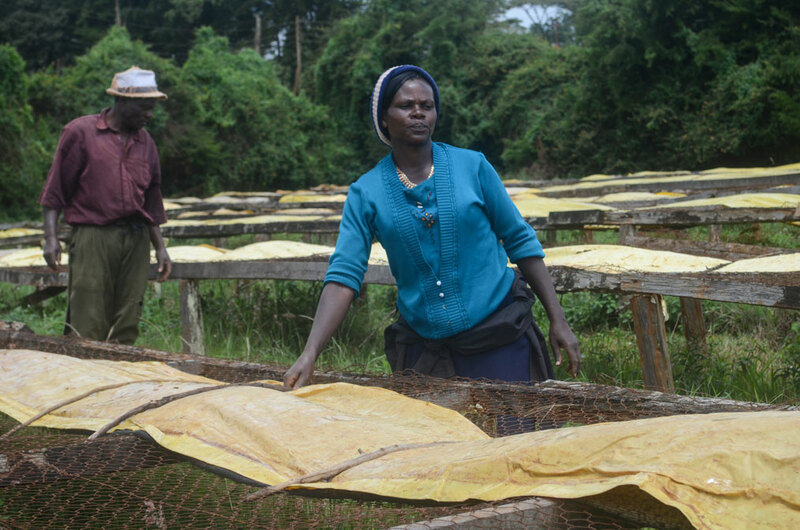 Grace Wanja (left) covering coffee on drying beds as Juliana Mombi takes a rest. While women and women’s rights organizations throughout the country, including FIDA, celebrated this landmark ruling, it has, naturally, caused outcry from men and lobby groups advocating for men’s rights. Nderitu Njoka, chairman of Maendeleo ya Wanaume (Men’s Rights Organization), is one of those opposed to the ruling. “This is unacceptable,” he tells Kenyan news outlets. “African communities have their own rules and regulations on Inheritance. They should be allowed to use them.” Women have hope for more changes—changes that aren’t coming at the required pace. Coffee has been a traditional cash crop in the Mount Kenya region for generations. But generally, coffee farmers are the poorest in the agricultural sector in Kenya. Their returns have continued to decline due to high cost of farm inputs, fluctuation of prices in the international market, and other factors. The trend has forced many farmers to start growing other cash crops, such as macadamia nuts and avocados. Whichever way things will go, for the better or worse, women providing most of the labor will continue to suffer as men, under the disguises of outdated traditions and customary laws, continue to exploit them.